Mockernut hickory is a large tree with a narrow to broadly rounded crown and stout, ascending branches. Leaves are alternate, feather-compound, 8–15 inches long, with 5–9 (usually 7) leaflets; leaflets 3–7 inches long, 1–3 inches wide, broadest near the middle; margin toothed, upper surface yellowish green, shiny; lower surface paler, densely hairy with light orange or brown hairs. Crushed leaves smell spicy, like orange rind. Leaf stalk has dense hairs. Bark is gray, grooves shallow; plates flat, tight, never shaggy. Twigs are stout, brown to dark gray, very hairy at first, smooth later; pores pale; terminal buds distinctive: light tan, large (½ inch or greater), hairy. Flowers April–May; male and female flowers separate on same tree; male catkins in threes, 4–5 inches long, hairy; female flowers 2–5, in hairy spikes. Fruits September–October, with a dark reddish brown husk 1½–3½ inches long, widest at the middle; shell thick; nut strongly 4-angled, top long-pointed, kernel sweet, edible. Dense hairs on leaf stalks and undersides of leaves are a key characteristic of mockernut hickory. Mockernut hickory reaches 100 feet high with a narrow to broadly rounded crown and stout, ascending branches. The fruits of mockernut hickory have a thick, dark reddish-brown husk 1½-3½ inches long, which is widest at the middle. Occurs in dry upland woods on upper slopes and ridges, commonly in acid soils over chert, sandstone, or igneous rock; occasionally in low woods along streams. Nearly statewide, except for the far southeast corner and northwestern counties. 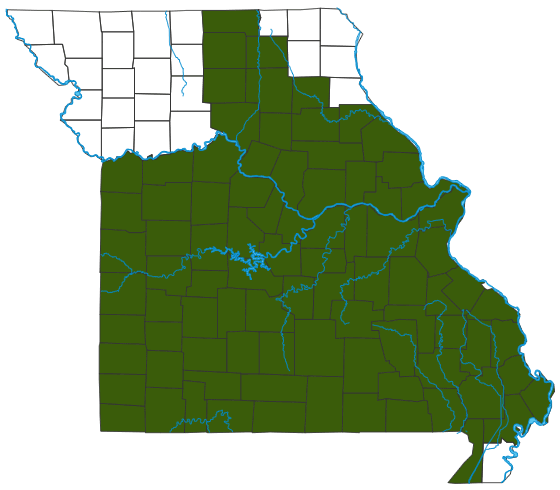 It is most common south of Missouri River. The wood of this tree is probably the hardest of all the hickories and is used for tool handles, wood splints, skis, rustic furniture, and charcoal. Early American colonists reported that Indians processed the nuts into “a fine oylie or mylke liquor.” With our other hickory species, mockernut contributes a rich golden-yellow to our state's fall color palette. Nuts are eaten by squirrels, mice, and deer. Squirrels also eat the buds. As with other hickories, its leaves are food for large, showy moths, including the luna moth, several colorful underwing moths, and the giant regal moth, which has an impressive 6-inch wingspan.